The Smurfs has been featured as Happy Meal toys twice for the first movie and it's sequel. Smurfs: The Lost Village is an animated movie and a reboot film of The Smurfs. The toys consists of 8 mushroom houses of different colors. Smurfs: The Lost Village Happy Meal is now available at your favorite McDonald's stores nationwide. 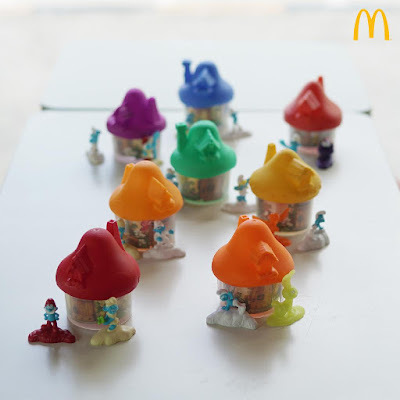 Each Happy Meal comes with one of your favorites from McDonald’s – Burger McDo, Hamburger, Chicken McDo, McSpaghetti or 4pc Chicken McNuggets meal and a toy. You can also order the meal thru McDonald's delivery hotline 8MCDO (8-6236). Smurfs: The Lost Village will start showing on Philippine cinemas on March 31 and this Happy Meal toys was released last March 25. If you are a Happy Meal toy collector, start collecting now while all toys are available.